A bit of a damp day.. 3 hours of heavy rain during☔ today’s match,!! But mild and a gentle wind.. It dried up eventually around 2 pm. Some nice nets of silvers today, and a few bonus carp were caught along the length of the lake. And true to form, Barry adopted the same tactics, same rigs and caught a few fish. A nice mix of big and small ide, skimmers, roach and one small carp saw him weigh in 32lbs 4oz to take the section and Lake win for the second time. Just for the record, he’s yet again only fed half a pint of maggots using the kinder pot on his pole.. A cheap bait bill.! 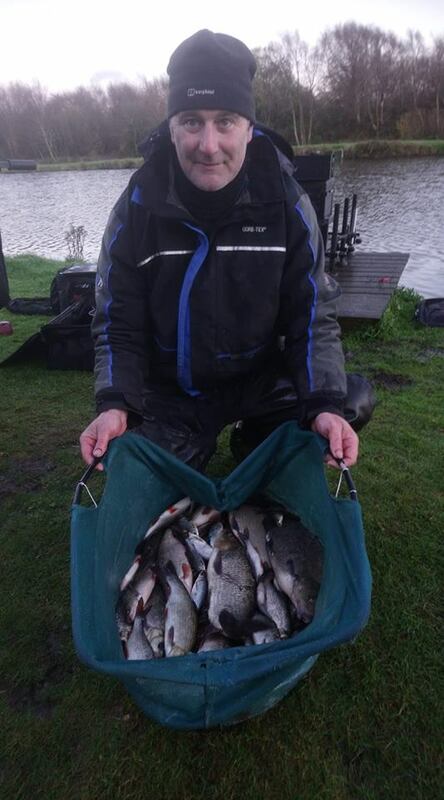 Second in the section was Symon Willan who had 5 carp on bomb and pellet, and a nice mixed net of silvers, ( roach and skimmers.) on the pole using maggots to weigh in a respectable 21lbs 2oz, Don Lines was very close behind with 20lbs 6oz in what proved to be a good close section. Section 2 was won by Jerry Blythe, who opted to feed maggots little and often on his pole line at 13m. 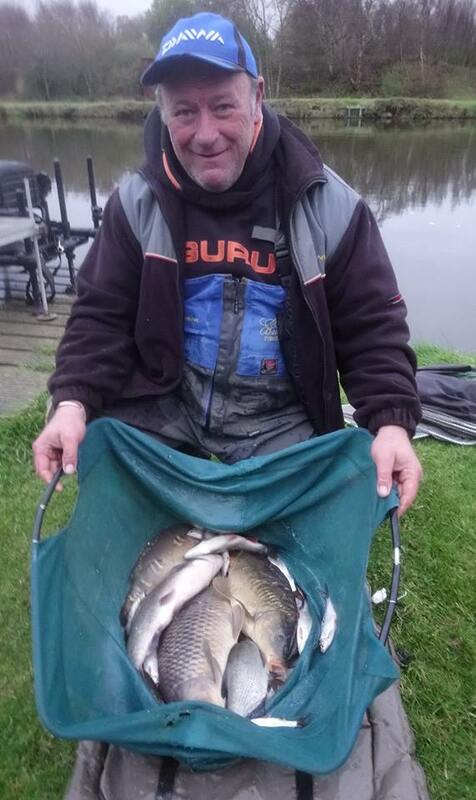 Jerry caught steadily throughout the match to put 28lbs 8oz of silvers on the scales, a cracking mix of roach, skimmers and ide of all shapes and sizes.. Well done Jerry.! 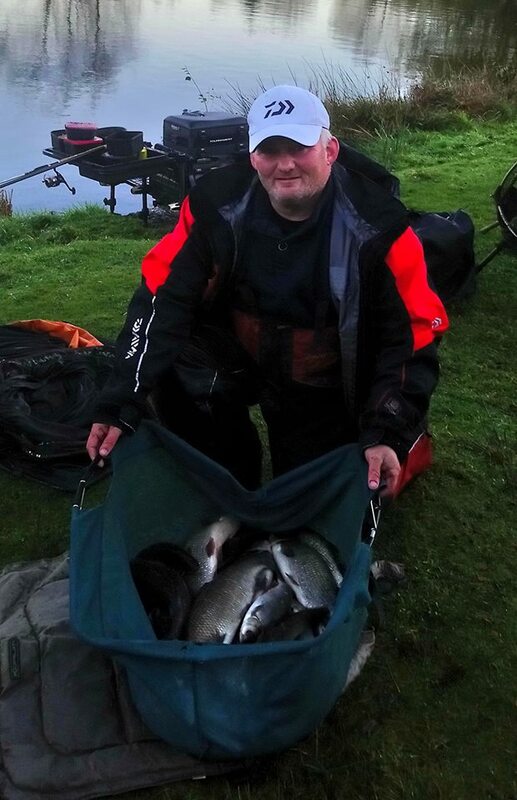 Mr consistent Ian Whitson was a very close second, again with another impressive mixed net of silvers for 25lbs 2oz, all caught on maggot/pole at 13m. By contrast, Ian had to feed heavier to get those bites along with the better-sized fish… Every peg seemed to fish differently today. Lots of carp lunging around today but very reluctant to feed, but a dozen or so were landed. Some nice winter nets of silvers today and good to see the Skimmers starting to feed. Well done guys, thanks for supporting the match.